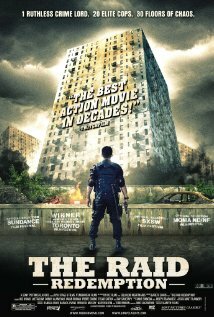 The Raid: Redemption is an absolute explosion. The movie kicks like an energy drink. I had heard that the movie was really good, but I did not know what it was about before watching it. The only thing that I did know was that Mike Shinoda of LinkinPark and Joseph Trapanese developed the soundtrack for the movie. They collaborated with Chino Moreno the lead singer of Deftones (one of my favorite singers and one of my favorite bands) and he contributes his awesome vocals to the first song in the ending credits called “Razors.Out”. Being the big Chino Moreno fan that I am, I had downloaded the song off of iTunes before I had even heard of The Raid: Redemption. The song meshes the sound of Linkin Park with Deftones. I was bummed that they didn’t make a whole album together because it was pretty sweet. The movie was filmed in Indonesia and the entire thing is subtitled, or you can choose to watch it dubbed over in English. There is not much to the story, but with this type of action movie that makes no difference at all. If you are the type of person that does not enjoy watching foreign films because of subtitles or for any other reason, I strongly suggest that you give this film a chance. You will quickly forget that you are reading subtitles or that the words you hear don’t match the lips on screen. I cannot think of a movie that has more action throughout than this one. I was very pleasantly surprised when I watched this movie. So much so, that I actually watched it twice in the last couple of months. This film came out of nowhere. It snuck up on me and punched my mind in the face. The film is about a squad of 20 heavily armed cops who raid a 30 floor apartment building that is home to a drug kingpin and his ruthless gang. The apartment building has security surveillance cameras and the tenants have plenty of firepower of their own. When the bullets start running out, that is when the real action begins. There are many similarities between this movie and Dredd (2012). To read my review of Dredd (2012) click on this link. 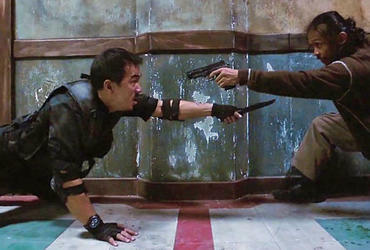 The biggest difference between the two films is that The Raid: Redemption is a far superior film. The fighting sequences and action in the film were nothing less than amazing. There is a little overuse of swearing, but the stress that these people are facing justifies it all. There are martial arts like I have never seen. There is blood, guts, violence, guns, weapons, fighting, fighting, and more fighting. The story is not as solid as it otherwise could be. They took out all of the stops and made this a full-fledged action movie, so really the story does not matter too much. On the other hand, if the writing had been a little bit better the movie could have easily been a 10. Being that it is a foreign film, the cast and filmmakers will be a bunch of people that you probably have never heard of, but I’m going to list them anyway. It was written and directed by Gareth Evans. 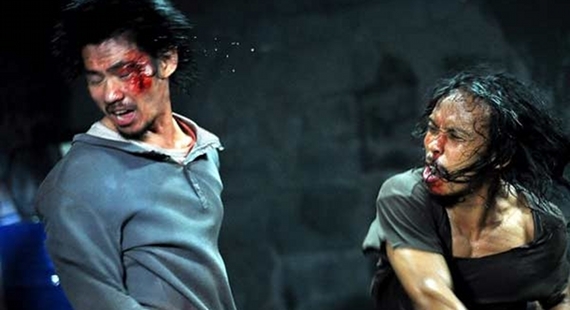 The main stars of the film are Iko Uwais, Joe Taslim, Donny Alamsyah, Yayan Ruhian, Pierre Gruno, Ray Sahetapy, Tegar Satrya, Iang Darmawan, Eka ‘Piranha’ Rahmadia, and Verdi Solaiman. Click on the link below to check out the teaser trailer to the sequel to The Raid: Redemption, it’s called The Raid 2: Berandal (2014). Posted on March 11, 2013, in Action Movie Reviews, Foreign Movie Reviews, Martial Arts Movie Reviews and tagged Chino Moreno, Deftones, Donny Alamsyah, Dredd (2012), Eka 'Piranha' Rahmadia, Energy Drink, fighting, foreign films, Gareth Evans, Iang Darmawan, Iko Uwais, Indonesia, iTunes, Joe Taslim, Joseph Trapanese, Linkin Park, LinkinPark, Man of Tai Chi (2013), Martial Arts Movie, Mike Shinoda, movie, Pierre Gruno, Raid, Ray Sahetapy, Redemption, soundtrack, Tegar Satrya, The Raid 2: Berandal (2014), The Raid: Redemption, Verdi Solaiman, Yayan Ruhian. Bookmark the permalink. 3 Comments. Really liked this movie. Just nonstop kickassery. Yes, the writing was weak, but as you said, who cares when you got all that awesome action going on. I too am a Deftones fan, so that was just icing on the cake for me. Thanks for the nice comment Josh! I liked how quick and to the point everything was. Sometimes that is the definition of a good action movie. Get to the action and keep it going nonstop. If only Chino Moreno could release some more good albums. I have not enjoyed the Deftones most recent albums and that is why the song he did for The Raid soundtrack was even better.